Working in Hyper-V before moving all of our resources from physical servers in datacenters to Azure IaaS or PaaS, we regularly took new snapshots of Virtual Machines (VMs) before testing major development changes, adding Windows updates, testing new application settings etc., to allow us to easily revert to the previous state of the VM if desired. 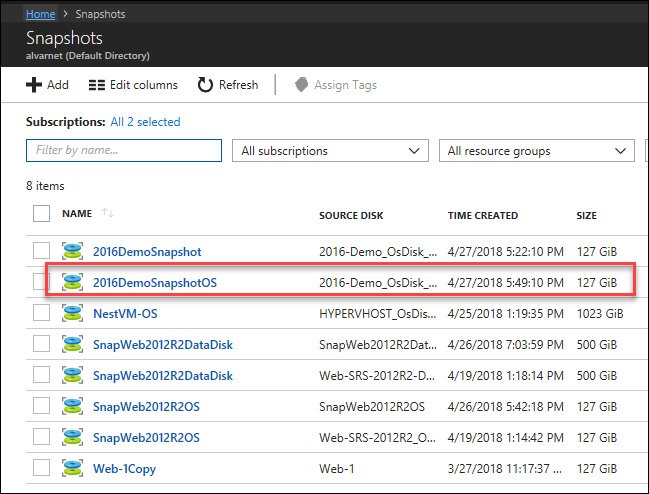 In Azure, snapshots are taken of the virtual disks (vhd), not the VM instance itself. Snapshots are full, read-only copies of the vhds. A new VM is created with new managed disks created from stored snapshots of OS data disks; data disk snapshots are turned into managed data disks and then attached to a VM. To create a copy of production servers for use in development, or the opposite, copy a dev environment into production mode. To create a ‘repository’ of prepared OS and data disks for use in creating multiple VM copies. To create a dr backup repository of snapshots in a different region or subscription (or both), in case of accidental deletion of key OS or data disks. Backing up a VM before making a major change – although it is not possible to revert the VM to the previous state, the VM can be deleted and using the saved snapshots > create new managed OS and data disks > create a new VM using the previous VMs Nic, etc. These directions are for taking a snapshot of a managed OS disk in these examples – ARMs default vhds. Add your own values for the parameters in the POSH below. $resourceGroupName = "<Your Resource Group Name>" $vmName="<Name of VM>" $Location = "<Your Location>" $snapshotName = "<Snapshot Name>"
$resourceGroupName = "<Your Resource Group Name>"